Chris Thompson was ready to leave Washington after not making the team four years ago. Now, he's closer to his head coach than ever before. Republished from The Sports Capitol with permission. ASHBURN, Va. — If the Washington Redskins presented players a “Mr. Congeniality” award, Chris Thompson would retire that sash. The slashing running back wasn’t feeling so friendly in 2014 when he didn’t make the initial roster entering the regular season under then first-year head coach Jay Gruden. Sure, the Redskins wanted Thompson around on the practice squad. But the 2013 fifth-round pick couldn’t have cared less about their wants at the moment. 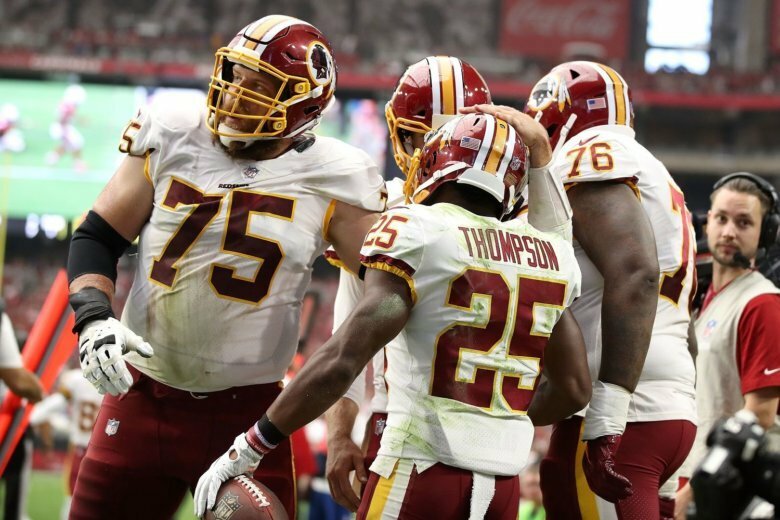 The undersized back that four years later plays a large role in Washington’s offense remained for three reasons: 1) The raw emotion receded, 2) No other team signed him off the Redskins’ practice squad, 3) Gruden convinced Thompson of a grander plan. Thompson had a choice. Believe this man, a coach who wasn’t with the organization the prior year when Washington drafted Thompson, or let the current anger carry the day. Gruden showing belief in the little dual threat won out. SUBSCRIBE TODAY | Like this article? Support The Sports Capitol by subscribing today. Fortunately for the 5-foot-8, 195-pound back, Gruden prefers when Thompson avoids smacking into massive and sturdy structures. Good thing for the coach is that the playmaker has turned into one of the league’s best at doing just that with the football in his hands. Despite sitting out the entire preseason while finishing his recovery from a fractured fibula suffered in Week 11 at New Orleans last season, Thompson delivered a magical performance in Washington’s 2018 season-opening 24-6 win at Arizona. He served as the outside counter to Adrian Peterson’s inside power. Thompson compiled 128 yards from scrimmage along with a receiving touchdown on just 11 touches. His 65 yards on five carries jumped his career yards per carry average to a wow-level 5.4. The hurt over not making the 2014 roster stuck with Thompson, “for a while. I didn’t let them see it.” He remained on the practice squad until the season’s final month. Gruden’s vision began showing the following season when Thompson caught 35 passes. Another 49 came the next year before his 2017 breakout campaign with 804 yards from scrimmage and 39 receptions in 10 games prior to the injury. The organization showed faith in Thompson before the 2017 season by signing him to a two-year extension that carries through 2019. The coach being honest and direct four years prior helped Thompson remain positive about Gruden. The most significant conversion in their relationship came in September of 2014. Their fondness for one another, just like Thompson’s career, has only gained momentum since. Ben Standig is a host, writer and co-founder of The Sports Capitol. This D.C. area native grew up rooting for all the local squads and dabbled in the professional media world after college before making a full shift to sports writing in 2005. Since, Ben has covered every team and big event in town for several outlets including the Associated Press, NBCWashington.com and Scout.com. The Sports Capitol is a WTOP news partner. Based in Washington, D.C., The Sports Capitol’s reporters cover the Redskins, Nationals, Capitals and Wizards. They also cover news on Maryland, Georgetown and GW sports, as well as local athletes. Subscribe to The Sports Capitol today.